A chairde, ar dtús ba mhaith liom fáilte ón chroí a chur roimh gach duine don ócáid anocht. Is ócáid tábhachtach, spéisialta é seo ina bhfuil muid ag céiliúradh noacha bhliain ón céad Dáil Éireann. I want to thank everyone who helped to ensure that today’s commemorative event reflects the reality and spirit of that historic First Dáil Éireann. Bhí súile na hÉireann ar an áit seo ansin. Bhí dóchas cosmhuintir Impír na Sasanna orthú fosta. Nach deas an rud dá ndeanfainís a leithid! Sitting in this hall, participating in or listening to those first speeches of a free Irish nation – given entirely in Irish – and knowing that the Republic declared in arms at Easter 1916, had been ratified by the people: it was a defining point in Irish history. Dhiúltaigh siad glacadh le toil muintir na hÉireann. Ní raibh na Sasannaigh in Éirinn ró-shásta riamh le daonlathas don tír seo. However, the courage of those who took up arms in 1916, the public anger at the executions of the leaders, and the Sinn Féin manifesto for change, resonated with the voters, many of whom – particularly women voters – were going to the polls for the first time. The only woman elected in Ireland and Britain was Constance Markievicz for Sinn Féin. She became Minister for Labour in the First Dáil, one of the first women government ministers in the world. Níor chóir dearmad a dhéanamh air seo. Creidim go bhfuil an fonn sin, fonn na saoirse ag muintir na tíre seo go foil. The inaugural meeting of the First Dáil Éireann, here in the Mansion House on January 21st 1919, was an unequivocal act of national self-determination. Tá an t-éileamh sin beo go fóill. In the course of that first meeting, Dáil Éireann issued a Declaration of Independence and a ‘Message to the Free Nations of the World’. Spreag na focail seo pobal na hÉireann agus daoine eile ar fud an domhain chomh maith. 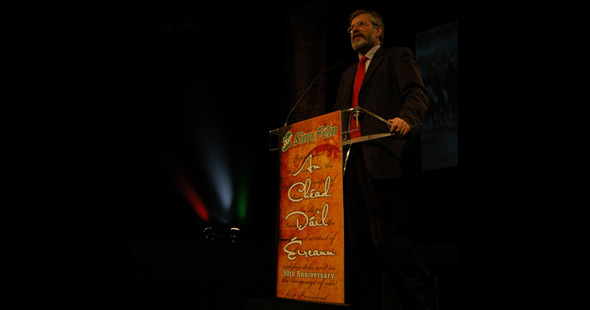 In words that reverberate today for those throughout the world still struggling for freedom and justice, the internationalist message of the First Dáil Éireann was unambiguous. But let me be very clear. Caithfidh muid bheith díreach fá seo. Caithfidh deireach theacht leis an coimhlint i nGaza, caithfidh cainteanna fiúntach tharlú ansin idir achan pháirtí gan mhoill. 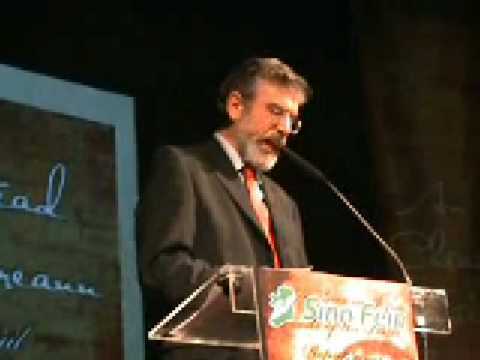 Tá Sinn Féin ag iarraidh Sos Cogaidh anois. Ag pilleadh ar cheist na hÉireann arís. The First Dáil Éireann also set out a visionary Democratic Programme of social and economic goals based on equality. Tá na focail uilig seo, agus an meid seo leanas tabhachtach inniu. It pledged to build Ireland’s economy and reinvigorate industries, which would be developed “on the most beneficial, progressive, co-operative industrial lines”. Nach deas na foclaí sin, ach is mór an trua nach bhfuil an rialtais i mBaile Átha Cliath a cuir i bhfeidhm iad sa lá ata inniu ann. Cén sort fís é seo do pháistí agus sliocht na gceannairí ó na laetha úd? That was a good and necessary event. It should have been here today on the actual date of the inaugural meeting of the First Dáil. The problem is, no one in the Government remembered until the last minute and when they went looking for the use of this space, Caoilfhionn Ní Dhonnabháin and Dawn Doyle had already booked the Mansion House on behalf of Sinn Féin. Today is the real deal, though I regret that the Taoiseach, Brian Cowen, representing the South, and the joint First Minister, Martin McGuinness, representing the North, are not here today to co-celebrate this anniversary of An Chéad Dáil. Side by side with our leader in Leinster House, Caoimhghín Ó Caoláin, TDs Martin Ferris, Arthur Morgan, Aengus Ó Snodaigh; Senator, Pearse Doherty; our MEPs Mary Lou McDonald, Bairbre de Brún and Sinn Féin councillors from across the 32 Counties are all gathered here tonight. The First Dáil was suppressed and Ireland was partitioned. The declarations of social intent in the 1916 Proclamation and the revolutionary programme of the First Dáil were abandoned and as occurred yesterday, occasionally resurrected by successive governments only for lip service. Tá sé scannalach nach raibh pleanáil ná ullmhú don am le teacht déanta ag an rialtas. And it targeted the most vulnerable – the sick, the elderly and children. Now is the time for the people of Ireland to work together – to draw upon our strengths, to share and create a common purpose based upon our rights as citizens and our pride and confidence in our country and its people. Members of the First Dáil knew the importance of using and reviving the Irish language – indeed the proceedings of the inaugural First Dáil meeting were in Irish. There must be a focus on ensuring that the Gaeltacht areas are not undermined and that Irish-language education is supported across the island. D’fhulaing glún i ndiaidh glúine thar na blianta. Tá níos fearr tuillte againn anois. Those elected to govern must be guided by the vision espoused in this hall in 1919. They must plan for the future – not the next general election. Níl ciall ar bith leis an teorann gráine sa domhan, san Eorap ina bhfuil muid inniu. 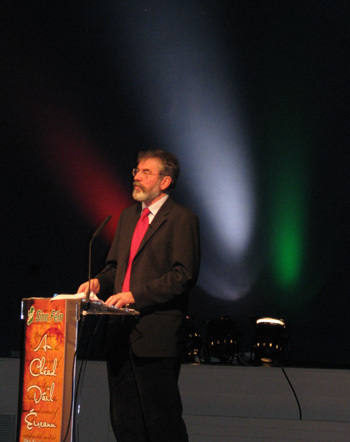 Sheas mórmhór na ndaoine leis an Phoblacht nócha bliain ó shin. Sinn Féin is for the construction of a new national democracy – a new republic – on the island of Ireland and reconciliation between orange and green. Tá obair de dhíth – níl sé ag dul a tharlú gan sár-iarracht. Our responsibility is to ensure that unionists are comfortable and secure in a new Ireland. It is their Ireland also. Tá an-speis ansin acú go foíll. Bhuail mé lena lán sean-chairde thall ansin. In the meantime, we are engaging with Irish communities, MPs, other politicians, trade unionists and others right across our offshore island – most recently in places like Leeds, Newcastle, Liverpool and Birmingham, as well as in London itself. The planned London conference will not be the conclusion of this work – it will mark a stage in what must be a longer-term campaign. These are hard times for Ireland – North and South – though people in other regions have harder times. The leaders of the Rising in 1916 or the First Dáil were called upon. It was great to see such large turn out for this special occassion, to commemorate the 90th anniversary of the First Dáil Éireann. What made it even better was to see our leaders adress those less fortunate enough to get in the gate as there was no more room inside the Mansion House. If this had been any other political party I doubt very much if the likes of Brian Cowen, Enda Kenny or Mr Gilmore would have stood out in the cold weather to give these people their time. Jeez…. talk about biting the hand that feeds you. 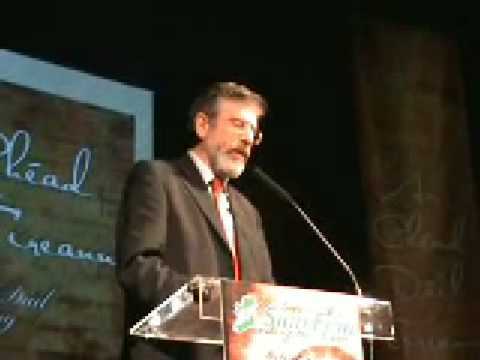 Just watched Gerry Adam’ speech on You tube there, billiant! A great socialist one, keep it up! 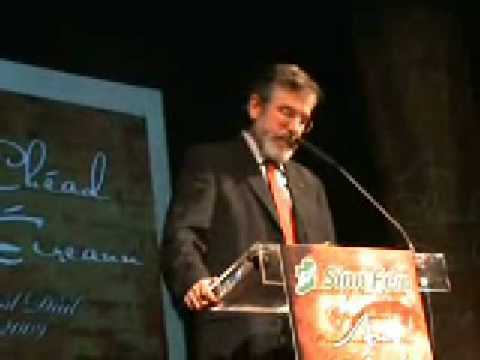 Just watched Gerry Adams’ speech on youtube there. Brilliant! A great Socialist one. Keep it up!